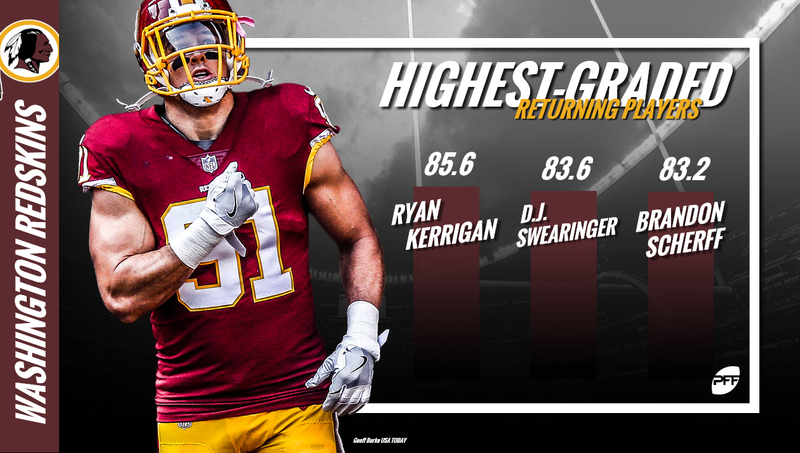 The Washington Redskins have been mediocre for quite some time, but they are now in position to make a splash in the NFC East. The Philadelphia Eagles won the Super Bowl. The New York Giants’ confidence is high with the addition of Saquon Barkley. The Dallas Cowboys still like what they have in Ezekiel Elliott and Dak Prescott. But there’s a storm brewing in D.C., and it starts with a complete offensive overhaul. There’s a new quarterback in town, there’s a dynamic rookie running back and there’s the addition of an extremely underrated wide receiver. Make no mistake, there is work to be done – but this won’t be the same team of the last five years. When the Redskins open camp July 25, all eyes will be on the offense. Much of their draft was dedicated toward upgrades at defensive positions, but fans will have high expectations for their new offensive weapons. Those expectations start with Alex Smith, Derrius Guice and Paul Richardson – all newcomers to the team. If those three can find a rhythm in training camp and carry it over to the regular season, the Redskins can be dangerous. Smith is one of the more underrated signal-callers in the league and it’s likely because he keeps his head down – but he puts up impressive numbers while at it. He threw just five interceptions last year, and his adjusted completion percentage was a sky-high 78.8 percent, second among quarterbacks. But anyone can complete a dinky two-yard drop-off, right? Smith knows, and that’s why he had the highest passer rating on deep throws (20 or more yards) in 2017. He had 12 touchdowns on deep passes to just one interception – and was one of only two quarterbacks to have above a 50-percent adjusted completion percentage on those throws. So, how will Richardson and Guice fit into this seemingly simple puzzle? For starters, Richardson was one of the more clutch receivers in 2017 — even if no one knows it. He had the third-highest passer rating when targeted in the fourth quarter and overtime. He had a perfect rating in those quarters on contested targets. If Smith and Richardson can develop this chemistry early in training camp, defenses across the league will take notice sooner rather than later. That leaves college superstar Derrius Guice. If he can find his footing within the first few weeks of the season, it will take a ton of pressure off Smith (and Jay Gruden). Of 239 NCAA running backs in 2017, Guice graded out as the 10th best, with an 87.4 grade. Guice will likely split snaps with Chris Thompson, so training camp and preseason will more so be a testing grounds for whether he is capable of being a feature back. The numbers aren’t flashy, and they do show a need for improvement in some facets. His pass-blocking wasn’t great, and it was something he was asked to do on nearly 50 percent of LSU’s passing plays. He wasn’t asked to do much in the passing game either, never surpassing 30 receiving yards in a game in 2017. However, he did force 44 missed tackles on rushes, which was tied for 17th among FBS running backs in 2017. 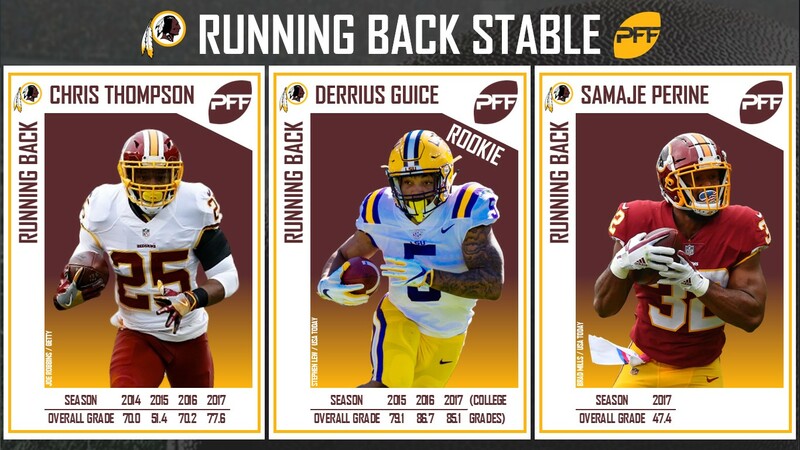 Swiss-army knife running backs are becoming more popular in today’s NFL, so if Guice is to take over the spotlight in the Washington backfield, he’ll need to improve other areas of his game. With the addition of Da’Ron Payne in the first round of the draft, the Redskins’ defensive line is a formidable one. He greatly improved his run-stopping ability from 2016, ranking 13th in his run-block grade in 2017 compared to 83rd in 2016. Not to mention, one of his best games of the season came in the National Championship, where he exploded for seven QB pressures and six defensive stops. Jonathan Allen, a sure-fire starter next to Payne, would likely have been in the running for defensive rookie of the year had he stayed healthy. In just five games of work, he racked up three sacks, three QB hits and three QB hurries along with eight defensive stops. In Week 4 against the Kansas City Chiefs, he had an 84.0 overall grade, 13th among interior defensive lineman. However, the other end of the line has some questions to be answered with likely three players vying for the spot. Can Jordan Reed still to produce at an elite level?